The AIM NetworkNews and PoliticsHockey plays golf with Trump while banks are hung out to dry. 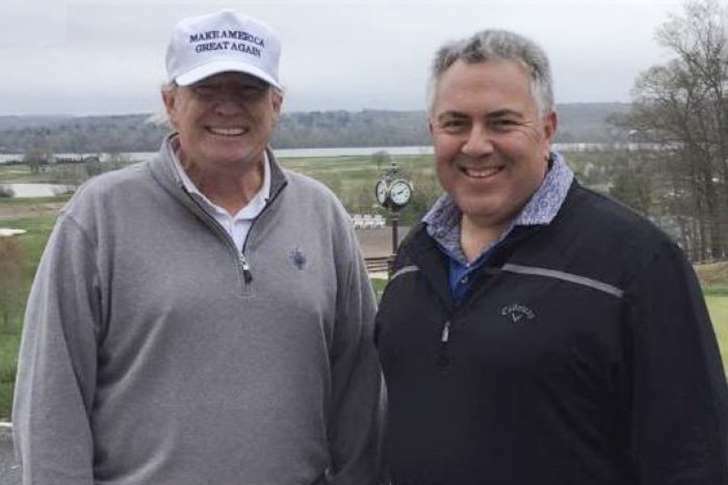 Hockey plays golf with Trump while banks are hung out to dry. Our nation thrills to news, Monday, that our own $360,000 PA, Ambassador to the US, (plus $90,000 PA parliamentary pension), Joe, “The Age of Entitlement is Over”, Hockey, is golfing with Donald Trump, joining the president at the links, if not the hip, in yet another diplomatic coup for Tony Abbott’s failed treasurer. Doubtless, “Sloppy Joe” will be talking up the president’s incredible success with his illegal Syrian missile strikes, a week ago, timed to distract from Stormy Daniels’ testimony and to beat weapons inspectors from the Organisation for the Prohibition of Chemical Weapons with their pointless, pedantic search for evidence of chemical weapons. In Limbaugh’s view, Roberts explains, the core institutions and norms of American democracy have been irredeemably corrupted by an alien enemy. Their claims to bipartisan authority — authority that applies equally to all political factions and parties — are fraudulent. There are no bipartisan authorities; there is only zero-sum competition between tribes, the left and right. Two universes. A similar mindset is emerging in Australia. Tribal epistemology informs Peter Dutton’s dismissal of The ABC and The Guardian as dead to him. Sheesh! All he’s trying to do is spread false stories about the persecution of white South African farmers and arrange preferential immigration treatment so that they can swell the ranks of the right wing in his marginal, Dickson, QLD, electorate. Poor Peter. How wretched it is to be held to account. Erik Jensen, The Saturday Paper’s editor, lists seven refugees who have died under Peter Dutton’s regime as a result of the failure of his duty of care as Immigration Minister. They are also dead to him. Yet it is clear from Dutton’s comment that he views himself as blameless. Trump also acts as if he were beyond reproach. Always. His delusion is that he is a warrior in an ongoing battle against mainstream media – a media former chief White House strategist Steve Bannon called the opposition party. Even assuming some empirical basis to his accusation of chemical warfare, however, Trump could explain to Hockey how his professed concern for the Syrian people; his empathy for their plight, is reflected in his accepting only 11 refugees from that nation, this year. Trump’s hypocrisy in taking the high moral ground does not stop with his abandonment of the Syrian people, however. Joe would be well placed to ask why Assad’s use of chemical weapons provokes such a response when in Yemen, the US turns a blind eye to Saudi Arabia’s use of white phosphorous. Are Saudis also “gas killing animals“? Joe may also raise American troops’ use of depleted uranium, (DU) a weapon known to cause cancer and birth defects. DU was used in Syria in late 2015. U.S. Central Command (Centcom) spokesman Maj. Josh Jacques tells Airwars and Foreign Policy a report also confirmed by The Pentagon in The Washington Post, 16 February, that 5,265 armour-piercing 30 mm rounds containing depleted uranium were shot from Air Force A-10 fixed-wing aircraft on Nov. 16 and Nov. 22, 2015, destroying about 350 vehicles in the country’s eastern desert. Joe could ask his latest, bestie The President, moreover, how it is that in Saudi Arabia’s neighbour, Yemen, 8.4 million people are on the brink of famine; how 11 million children, require humanitarian assistance, because of a Saudi-led, US, UK and Australia-backed military blockade, using hunger and disease as a weapon of war, in a country that imports 90 per cent of its food and most of its medicine, as Dr Lissa Johnson writes in New Matilda. What a top opportunity to raise how 6.5 million Syrians have been internally displaced by war; the largest internally displaced population in the world. Hockey could explain how Illegal US airstrikes, prolong the war. All Trump’s Tomahawk “strikes” will do for Syrian people is to lower their wretched existence until it matches the living hell suffered by Yemen’s population where 15 million people have no hospitals, no doctors, no drugs. “Shoot first. Ask questions later” is the new State Department’s motto. It’s been a long time in the pipeline. In Clinton’s administration, development and diplomacy were cut 30%. Hockey also cut Australia’s foreign aid budget by $7.6 billion in his 2014 budget, followed by a further $3.7billion reduction in his December budget update. Now, the Coalition expresses concern after David Wroe of Fairfax suggests China is building a military base in Vanuatu. Shock horror. It’s a drop, a planted story to enable Turnbull to sound off – and to gauge the reaction. “We would view with great concern the establishment of any foreign military bases in those Pacific Island countries and neighbours of ours,” postures Turnbull. Unless, of course, they happen to be American bases. The US operates permanent military bases throughout the Pacific, including in Australia, Japan (21 bases), Guam and South Korea. Australia is being highly selective about its megaphone diplomacy. Perhaps Joe could talk economic equality and justice and how it is that the global increase in billionaires’ wealth in 2017 alone is enough to end extreme poverty seven times over. Tax cuts (or subsidies) for the rich will accelerate the process of burgeoning inequality, a symptom of both US and Australian politics’ toxic neoliberal infection. Doubly subsidised by taxpayers in his political retirement, Hockey, as Treasurer, was quick to call out bludging mothers who “double dip” by claiming both workplace and taxpayer-funded paid parental leave schemes. Of course it’s more than a stroke of luck that Joe scores a nine-hole round with the notorious cheat who is “unethical and untethered to truth”; a Mafia Don who is “ego-driven” and “about personal loyalty”, as former FBI Director James Comey flatters him, reports the Australian Financial Review. Joe’s always put in the hard yards. Hockey was also the sole guest to brave the rain; standing throughout Trump’s entire inauguration ceremony. Why, Toady Joe can spot a “significant historic moment“ to ingratiate himself as effortlessly as he can judge a “good” golf “companion”. Australia must have a lot of golf cheats, Suzann. Cheating at business, it is clear this week, from testimony of some of the “industry’s” key players, is the only game in town – especially when it involves our banks; an oligopoly that controls all lending and borrowing of money or giving advice on what is quaintly termed “wealth creation” – or “wealth management’. Many Australians are ruined by being sold dud investment advice. Sensational revelations of blood-sucking extortion, usury, bare-faced lying, robbery and a long litany of larcenies and law-breakings amaze and horrify audiences in this week’s installment of the long-awaited darkly, comic opera The Royal Commission into Misconduct in the Banking, Superannuation and Financial Services Industry. Round Two of the hearings, opened Monday in The Commonwealth Law Courts Melbourne and will run until 27 April. “Financial advice” is its focus, a service, bank staff attest, which is always in the interests of the bank and not its customer – a policy direction which has ruined more than a few clients. Evidence given is a dagger to the heart of de-regulation and laissez-faire capitalism, a core article of faith in the Coalition’s neoliberal religion. Yet they were warned. Labor’s reforms, The Future of Financial Advice (FOFA) were meant to address the conflicts of interest inherent in vertical integration but were undone by Finance Minister Matthias Cormann who talked Clive Palmer into supporting their repeal. The big banks and AMP hated FOFA, because it directly undermined their vertically integrated model in which financial planners were paid commissions for steering customers into their wealth management products. Yet in November 2014 Sam Dastyari, angered by how much of Labor’s FOFA was repealed by regulation, was able to exploit a rift between Clive Palmer and Jacqui Lambie to bring Ricky Muir with him to kill the repeal. It remains Sam’s finest hour. Yet full credit must go to Adele Ferguson’s account of the fiasco which ensued when The Commonwealth Banks’s wealth management arm, Commonwealth Financial Planning (CFP), gave evidence before a Senate inquiry into the Australian Securities and Investments Commission, ASIC. Labor’s Mark Bishop and Nationals’ John Wacka Williams led and focused the inquiry on ASIC’s bungling of the CPP case. The encounter irreparably damaged the reputation of ASIC and of the CBA. Westpac and ANZ quickly divested themselves of their wealth management – and later their insurance arms both areas of conflict of interest which have caused negative publicity. Only Westpac now continues to run either. Now, we are told, banks will go back to core business, their virtue restored. But can anyone believe that? Self-regulation, clearly, is a sham. The Australian Securities and Investment Commission, (ASIC), the corporate regulator or “tough cop on the beat” which Scott Morrison, Malcolm Turnbull, Kelly O’Dwyer, Josh Frydenberg, Peter Dutton (and any other government member with a set of talking points) never tire of pretending is more powerful than a Royal Commission stands exposed as utterly ineffectual, conflicted. Perhaps it suffers Stockholm syndrome. Captured, like the ATO, by the sector it is set up to regulate, ASIC ministers to the needs of industry not consumers. It remains chronically under-funded, suffering” efficiency dividends”, under Labor and more funding cuts during the ill-fated Abbott government experiment —cuts which, despite government rhetoric, have never been fully restored. 300 ASIC staff have been shed since 2014. Starring the Honourable Kenneth Madison Hayne AC QC, who, again, wins Beak of the Week for incomparable diligence, his talented assistant, Ms Rowena Orr QC, puts the cross back into cross-examination, in a crucifying performance which steals the show in a multimedia production live-streamed on the web. It’s damning. Customers’ signatures are forged, admit the pin-striped suits, clients are impersonated, power of attorney is got by fraud, documents are falsely witnessed, customer’s funds transferred to advisers’ personal accounts. Even the grave is no protection from these “Greed is Good” post-truth Gordon Geckos on steroids. The Commonwealth Bank (CBA) confesses that it has taken fees from some deceased clients, including one who’d been pushing up the daisies for ten years- fees, moreover, it was never entitled to had its client been alive. Naturally, as you would expect with self-regulation, CBA is on to it in a flash. A good four years goes into stonewalling; ignoring complaints. Two more years, it stalls; paper-shuffling “reports”. Finally, some bright spark notifies The Australian Securities and Investment Commission, (ASIC), a financial regulator whom the Turnbull government has been telling us for years is more powerful than a Royal Commission. The nation thrills to the inimitable Ms Orr QC, in her knock-out role as assistant to the commissioner. Orr demands straight talk; honest answers from a gang of knaves, liars and thieves as played by a cast of villains’ fall-guys and patsies from AMP, CBA and Westpac in Corporate Lies, Fraud, Extortion and Boundless Greed – this week’s episode. Not only is Ms Orr on song, she is an impeccably researched inquisitor who knows what the banks are up to. Bankers hang themselves out to dry in a show which, exposes, as Tony Abbott, might put it, The Great Big Old Hoax of corporate self-regulation. The hearings so far have shown banks can lie with impunity to the regulator. Evidence so far shows it is neither a few bad apples nor the corruption inherent in diversifying into insurance and investment advice, but rather that banking suffers a systemic blight. As Keane notes, the Royal Commission is not exposing flaws in the system – this is the system. Concentration has not benefited the consumer but has led to banks seeking greater power over the customer. ASIC has been a Clayton’s regulator; too timid to blow the whistle and so anxious to avoid litigation that it prefers to collude or as Keane kindly puts it, “work with” the industry. Political protection is built into the system. AMP, Macquarie and others have contributed $3.85 million in donations to the Coalition since 2010, while $2.66 million has been invested in Labor. Above all, Anna Bligh, a former Labor premier heads the Australian Banking Association while NSW Mike Baird received $900,000 after his first six months at the head of NAB’s corporate and institutional unit. Finally, taking a leaf out of Coalition energy and economics policy spin, our banks shrewdly deploy “independent reports” which are in fact heavily skewed in their favour. The Commission hears that the independent report AMP commissions from Clayton Utz is repeatedly edited by a variety of AMP staff right up to board level. Top marks to the producers, too, for their magical realism, especially Screaming Scott Morrison who rubbished the call for commission into banking as a “populist whinge” in 2016 and which he and his PM voted against 23 times but which the Turnbull government now hails as a triumph of its own invention even demanding applause for setting the terms of reference so wide they’re bound to catch every banking shonk and shyster in the land. The Royal Commission into banking unfolds a byzantine tale of deception and betrayal, helped in no small measure by a stellar line-up of performers including AMP’s libretto of lying to ASIC, fiddling reports, dudding clients and charging fees for no service. For the government it is more than an acute embarrassment; it is an indictment. Proved hollow is their faith in the powerful corporate regulator, ASIC, now revealed to be a toothless tiger while their spin that a few rotten apples must not cause us to fear that the root and branch of the banking system seems patently absurd. In fact, the Commission is providing abundant evidence the opposite is true. Sadly for Malcolm Turnbull’s Coalition, the stench of corruption in our banking system comes just as it must persuade just a few more cross-benchers that a great big new tax break, to adapt Tony Abbott’s anti-carbon slogan is urgently needed – when it will in effect reward the banks’ failure to operate a fair, open and accountable system – adding, Bill Shorten argues, $7 billion dollars to the big banks’ bottom line. Of course, screaming ScoMo rants, there’ll be hefty fines and even ten-year prison sentences. But when did you last hear of a banker going to jail? As for the fines, they’ll be HUGE – up to $10.5 million, three times the illicit gains or loss illegally avoided. 10 per cent of annual turnover. But fines will be capped at $210 million. And they won’t be retrospective. CBA’s profit was 9.9 billion last financial year. The proposed cap is 2% of that. Baloney. As a number of commentators note, the government must take us all for mugs. The new spin is contradicted by the evidence. Labor’s plan was rejected because the Coalition said it was so wide-ranging it would destroy our confidence and wreck the whole banking system. Now wide-ranging is good? In truth, the Coalition was dragged kicking and screaming into setting up the Royal Commission. What the government runs instead is a protection racket for a banking industry that breaks the law with impunity – a mob who knows shrewdly that even after the show trial and the ritual blood-letting, it’ll be business as usual because “they are too big to fail.” Too tightly integrated into each major party’s machine. The situation is not helped by the talking points that the PM’s turd polishing unit has given to the likes of Scott Morrison, Kelly O’Dwyer and even Republican at heart Malcolm Turnbull who, must speak from London as duty calls him away to tweet his way through Prince William’s waffling on to open CHOGM, – an organisation, which, like the Cheshire Cat is fading away leaving nothing behind but its smile or the promise of good intentions – give or take a few vapid clichés of colourful diversity – or meeting interesting people, or as Prince Will puts it “the mother of all networks”. The British Empire, it is said was acquired in a fit of absence of mind. It’s devolution into Commonwealth and now its genial atrophy into pleasantries and hearty handshakes all round is similarly out of focus; an exemplary model of indirection and self-extinction. If only our banking system; that many-headed, malignant, blood-sucking, toxic, monster parasite could exit our nation’s body politic, our commonwealth as painlessly. Excellent, Graeme. Your historical account and insights are fiendishly accurate. Spot on. And enjoyable. Ought to be in politics and history textbooks. Oh GH, what a wonderfully mischievous mind!! Taking only the Sloppy Joe point for discussion from this excellent analysis: The lack of sympathy or empathy shown by Sloppy Joe for Palestinians, Syrians and Yemenis may be in part attributed to his Jewish heritage and possibly Zionist leanings. Personally I grew up in a Jewish neighbourhood and have a lot of Jewish friends, but present celebrations in Jerusalem leave me pondering the question: “What is the difference between a Nazi jack-boot on the throat of a Jewish teenager in the Warsaw Ghetto in 1943 and an Israeli Defence Force jack-boot on the throat of a Palestinian teenager in the West Bank in 2018”? The answer is “75 years”. On a Trumpian note: I dread to think what will happen in the US if The Donald loads the IRS with his cronies and sycophants. Thank You David, And Thank You Graeme! Both very astute contributions. I hope the spruked up “improvement” in the Coalition’s appeal in the latest Newspoll is just a statistical aberration. How can such an inept, untruthful and anti-democratic Government that is continuously damaging the country even be within “cooee distance” of an increasingly capable and competent Opposition? I have wondered this since Sloppy Joe brought down that disastrous first budget of the Abbott Government. So too, I, like many, am incredulous that the American people could elect someone as incompetent as Sloppy Joe’s new-found golfing mate Donald Trump to be their President. And, after all the disastrous decisions the Trump Administration has made, why do the Republicans and Trump’s “base” continue to support the evil that the fool is doing all over the world? I found a partial answer in a very interesting article in today’s Politico which I know many AIMNers will find quite illuminating. There are some similar signs of this troubling link between right-wing religious movements and Conservative politicians here in Australia that all of us need to remain aware and wary of.